All of the data is from the standard set included with the game, so it would be simple to recreate what I have here. While not included with this file, I did use AS Craftable Institute stations in the pictures. 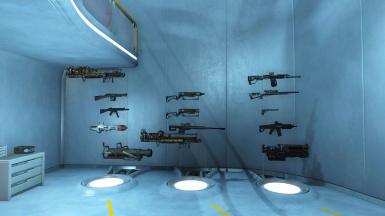 I would recommend you down load them here http://www.nexusmods.com/fallout4/mods/9715/? . The house is in Concord, in Fallon's Department store. 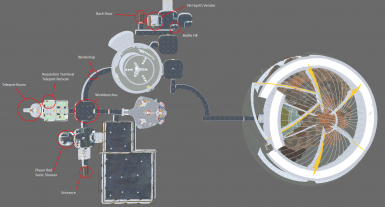 It would be a safe house for Institute agents, to allow for both extended surface missions, along with a potential fallback position, should it not be possible for any reason to reach the institute. 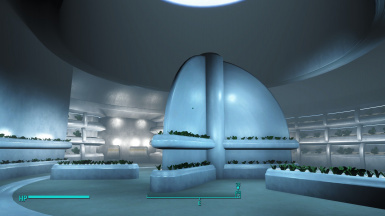 This is a simple player house that is an interior cell. 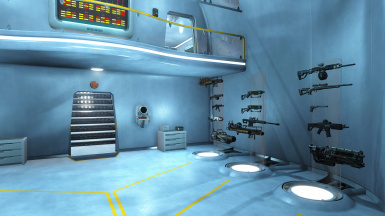 It has a player owned bed, a firing range, and a workshop. For people with issues, or if you prefer, I have created and uploaded a FOMOD, that can be downloaded from the optional files. I would recommend this for anyone having problems with textures, or scripts. ESP Version 6.5-Version 6.5 combines the Teleport remote with the ISH Admin Tape, into the Admin remote. It is located at the same point as the teleport remote used to be. 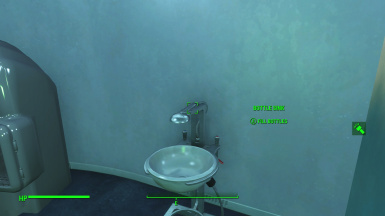 It allows you to teleport to many more places, as requested, and is shown through the Pipboy to add to immersion. 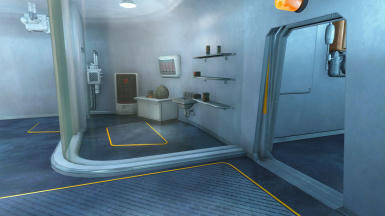 For those who wish to use the old teleport remote, or the Admin tape, you can get them from the requisition terminal. The Admin remote can be built from any chemistry station under utilities. 7) Summon a companion- You must have already signed up to travel with this companion. It simply brings that companion to you. 8) Reset the ISH Finding quest (for those that have trouble getting the quest to kick off. V6.01-Added a small container in the entrance with the key, in case the quest script doesn't fire. Also I am adding an overwrite file for the Synth Workshop Production mod by Kentington. 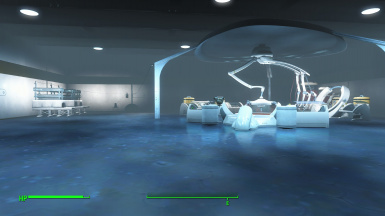 The overwrite file, will require both the Institute safe house and Workshop Synth Production, and this file. Make sure the Add On file is lower in your load sequence than the other two. This file will add the workshop directly into the Production Synth room in the ISH, you just need to hook it up. If you are using a current version of ISH, you may experience clipping, new players will have it without the clipping. 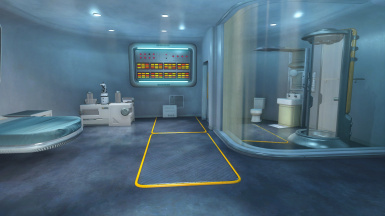 You can get the required tape to use the Synth Workshop at the place Kentington put them in or you can craft it under utility at the Chem station. A BIG THANKS to Kentington for allowing me to link to his mod. 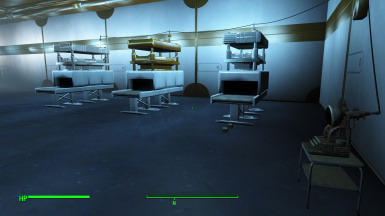 ESP Version 5.6-Version 5.6 Update allows for five alternate start states for the Institute Safe House. 3)Institute Start- The Safe House front door is linked to the bedroom door, of the temp quarters the institute provides. 5)Downtown Start(locked)- East of the CIT Ruins, House is locked, need key to get in. 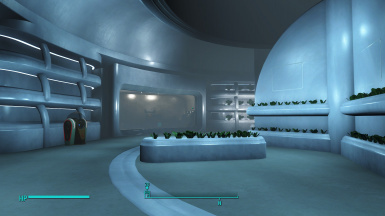 The menu kicks off when you leave the elevator pad of Vault 111. 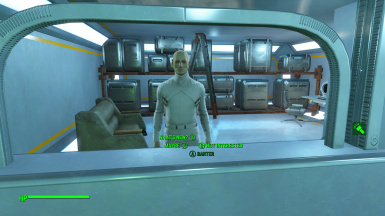 If you have a character already started and want to use this, just take them to the Vault 111 pad and head back to Sanctuary. 5.65- Added full Quest scripting, so now no matter which option you choose, it will provide an updated quest status, along with headers/pointers. This makes it much easier to find the downtown location the first time. ESP Version 5.5/5.51-Version 5.5 1fixes a few bugs and adds space to the warehouse, to allow for bigger items/machines. Also adds support for Workshop Synth production. Added a new menu in the requisition terminal that will add the items you need for the production of Synths, and the Fabricator. 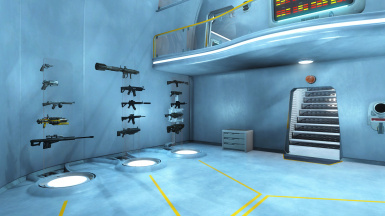 The items are added directly into the Workshop container, instead of the players inventory as there are quite a few. ESP Version 5.4-Version 5.4 adds several settlements to the teleporter. ESP Version 5.3-Version 5.3 updates the Synth Production area with the ability to set workshop items on the floor. It also updates the sonic shower, to cure Damage, Radiation, Addictions, and Disease. 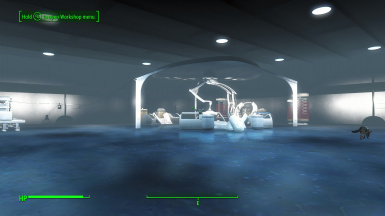 ESP Version 5.2-Version 5.2 bug fix to remove two errant lights at the end of the curved hallway leading to the dome, and added the auto door select feature which allows you to turn all of the auto doors on or off, using the terminal in the teleport room. ESP Version 5.1-Version 5.1 is a small bug fix, I have fixed the screw not coming from the requisition terminal. I also recompiled the teleport to insure it works correctly. ESP Version 5.0-Version 5.0 Adds 3 new areas. The first is the Warehouse. 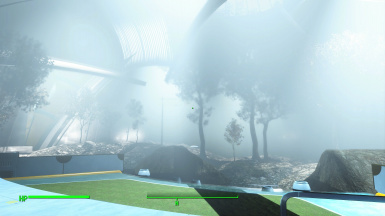 It is designed with high bay ceilings, to allow for manufacturing, under the new DLC Contraptions. An additional companion file under Optional files will add a few different looking presses to you workshop, however they work the same as the vanillia. It also will add an additional fusion switch under generators that will look appropriate, and power most of the presses, or lights you wish to place. 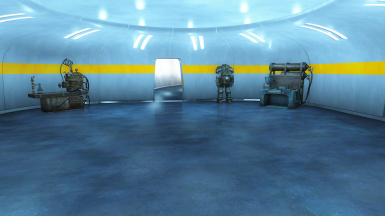 The second is the Synth Production room. Right now, it is just for show. 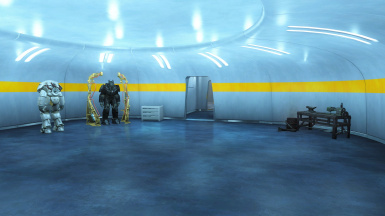 I may release a companion file, or an updated file that will allow you to use this room as your robot build room (DLC 1 Mechanist's ) if there is interest. The third room is the Dome. It is a very large area, with dirt, a small pond, and trees. You can put wells, or plants in the dirt, or most anything else I imagine. The last neat addition is automatic doors. I never understood why the doors look like doors off of the Enterprise, but you have to manually open them. Now you can just walk up to them and they automatically open. There were a few additional items added to the Requisition terminal to support manufacturing. 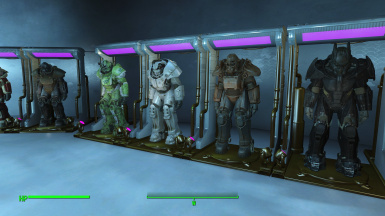 Contraptions Add On Version 1.1-Version 1.1 Adds Institute style manufacturing machines, a fusion switch to power, and both Power armor and standard displays in the institute style/materials. Bottle Fill- Refreshing drink and purified water bottle fill units in the back. Moveable Back Door- Placeable back door, move your back door where you want it. Integrated Vendor- Vendor that sells many items, and has a large purse to buy. 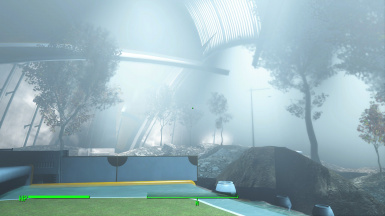 Advanced Teleportation- including submenus for Cities, Settlements, and User defined locations(Markers) New script forces un-equipping of the ring, which keeps it from launching the teleportation menu when entering/exiting power armor. Fusion switch- If you spend your life underground, or most of it anyway, you really can't have a combustible engine generator to light your space. 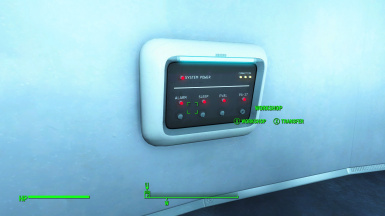 This item is a switch, under the generator workshop tab that is in the institute style, that actually generates passive power to energize lights. Works as a switch too. Sonic Shower-Step into the shower and wash those rads away. Heals you and your aching limbs after a hard day of adventuring. Transfer and Requisition terminals- For all of those times you just need a spring, or a gear, or when you wish you could get the contents of another workshop in your workshop.